People hearing the word HBA might not have any idea what they are listening too, but for those that do know what it means it might come as a shock to learn of one with no fewer than 40 ports. 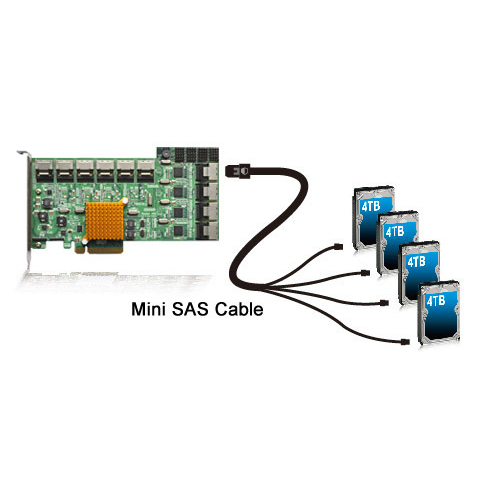 The Intelligent Storage Health Management Suite manages the PCIe 2.0 x8 host interface and 40 device channels. All in all, the card should easily enough provide any computer, be it a PC, a business computer or server, with up to 160 TB of storage space. Nevertheless, customers will have to buy their own HDDs with industry-standard SFF-8087 Mini-SAS connectors, which will bring the cost of everything far higher than the price of the board itself, which happens to be $739 / 568.86 – 739 Euro. Sales should start this very month (April 2013).